This article is about the Volvo Group (AB Volvo). For the separate manufacturer of passenger automobiles, see Volvo Cars. For other uses, see Volvo (disambiguation). The Volvo Group (Swedish: Volvokoncernen; legally Aktiebolaget Volvo, shortened to AB Volvo) (stylized as VOLVO) is a Swedish multinational manufacturing company headquartered in Gothenburg. While its core activity is the production, distribution and sale of trucks, buses and construction equipment, Volvo also supplies marine and industrial drive systems and financial services. In 2016, it was the world's second largest manufacturer of heavy-duty trucks. Automobile manufacturer Volvo Cars, also based in Gothenburg, was part of AB Volvo until 1999, when it was sold to the Ford Motor Company. Since 2010 it has been owned by the Geely Holding Group, China's biggest multinational automotive manufacturing company. Both AB Volvo and Volvo Cars share the Volvo logo and cooperate in running the Volvo Museum in Sweden. Volvo was established in 1915 as a subsidiary of SKF, a ball bearing manufacturer; however both the Volvo Group and Volvo Cars regard the rollout of the company's first car series, the Volvo ÖV 4, on 14 April 1927, as their beginning. The building remains (57°42′50″N 11°55′19″E﻿ / ﻿57.71389°N 11.92194°E﻿ / 57.71389; 11.92194). The brand name Volvo was originally registered as a trademark in May 1911 with the intention to be used for a new series of SKF ball bearings. It means "I roll" in Latin, conjugated from "volvere". The idea was short-lived, and SKF decided to simply use its initials as the trademark for all its bearing products. 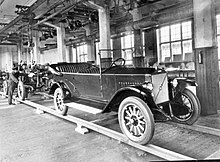 In 1924, Assar Gabrielsson, an SKF sales manager, and a KTH Royal Institute of Technology educated engineer Gustav Larson, the two founders,[clarification needed] decided to start construction of a Swedish car. They intended to build cars that could withstand the rigors of the country's rough roads and cold temperatures. AB Volvo began activities on 10 August 1926. After one year of preparations involving the production of ten prototypes, the firm was ready to commence the car-manufacturing business within the SKF group. The Volvo Group itself considers it started in 1927, when the first car, a Volvo ÖV 4, rolled off the production line at the factory in Hisingen, Gothenburg. Only 280 cars were built that year. The first truck, the "Series 1", debuted in January 1928, as an immediate success and attracted attention outside the country. In 1930, Volvo sold 639 cars, and the export of trucks to Europe started soon after; the cars did not become well known outside Sweden until after World War II. AB Volvo was introduced at the Stockholm Stock Exchange in 1935 and SKF then decided to sell its shares in the company. By 1942, Volvo acquired the Swedish precision engineering company Svenska Flygmotor (later renamed as Volvo Aero). Pentaverken, which had manufactured engines for Volvo, was acquired in 1935, providing a secure supply of engines and entry into the marine engine market. The first bus, named B1, was launched in 1934, and aircraft engines were added to the growing range of products at the beginning of the 1940s. In 1963, Volvo opened the Volvo Halifax Assembly plant, the first assembly plant in the company's history outside of Sweden in Halifax, Nova Scotia, Canada. In 1950, Volvo acquired the Swedish construction and agricultural equipment manufacturer Bolinder-Munktell. Bolinder-Munktell was renamed as Volvo BM in 1973. In 1979, Volvo BM's agricultural equipment business was sold to Valmet. Later, through restructuring and acquisitions, the remaining construction equipment business became Volvo Construction Equipment. In 1977, Volvo tried to combine operations with rival Swedish automotive group Saab-Scania, but the latter company rejected it. In the 1970s, French manufacturer Renault and Volvo started to collaborate. In 1978, Volvo Car Corporation was spun off as a separate company within the Volvo group and Renault acquired a minority stake, before selling it back in the 1980s after a restructuring. In the 1990s, Renault and Volvo deepened their collaboration and both companies partnered in purchasing, research and development and quality control while increasing their cross-ownership. Renault would assist Volvo with entry-level and medium segment vehicles and in return Volvo would share technology with Renault in upper segments. In 1993, a 1994 Volvo-Renault merger deal was announced. The deal was barely accepted in France, but it was opposed in Sweden, and the Volvo shareholders and company board voted against it. The alliance was officially dissolved in February 1994 and Volvo sold off its minority Renault stake in 1997. In 1991, the Volvo Group participated in a joint venture with Japanese automaker Mitsubishi Motors at the former DAF plant in Born, Netherlands. The operation, branded NedCar, began producing the first generation Mitsubishi Carisma alongside the Volvo S40/V40 in 1996. During the 1990s, Volvo also partnered with the American manufacturer General Motors. In 1999, the European Union blocked a merger with Scania AB. In January 1999, Volvo Group sold Volvo Car Corporation to Ford Motor Company for $6.45 billion. The division was placed within Ford's Premier Automotive Group alongside Jaguar, Land Rover and Aston Martin. Volvo engineering resources and components would be used in various Ford, Land Rover and Aston Martin products, with the second generation Land Rover Freelander designed on the same platform as the second generation Volvo S80. The Volvo T5 petrol engine was used in the Ford Focus ST and RS performance models, and Volvo's satellite navigation system was used on certain Aston Martin Vanquish, DB9 and V8 Vantage models. In November 1999, Volvo Group purchased a 5% stake in Mitsubishi Motors, as part of a partnership deal for the truck and bus business. In 2001, after DaimlerChrysler bought a large Mitsubishi Motors stake, Volvo sold its shares to the former. Renault Véhicules Industriels (which included Mack Trucks, but not Renault's stake in Irisbus) was sold to Volvo during January 2001, and Volvo renamed it Renault Trucks in 2002. Renault became AB Volvo's biggest shareholder with a 19.9% stake (in shares and voting rights) as part of the deal. Renault increased its shareholding to 21.7% by 2010. AB Volvo acquired 13% of the shares in the Japanese truck manufacturer Nissan Diesel from Nissan (part of the Renault-Nissan Alliance) during 2006, becoming a major shareholder. Volvo Group took complete ownership of Nissan Diesel in 2007 to extend its presence in the Asian Pacific market. Renault sold 14.9% of their stake in AB Volvo in October 2010 (comprising 14.9% of the share capital and 3.8% of the voting rights) for €3.02 billion. This share sale left Renault with around 17.5% of Volvo's voting rights. Renault sold their remaining shares in December 2012 (comprising 6.5% of the share capital and 17.2% of the voting rights at the time of transaction) for €1.6 billion, leaving Swedish industrial investment group Aktiebolaget Industrivärden as the largest shareholder, with 6.2% of the share capital and 18.7% of the voting rights. That same year, Volvo sold Volvo Aero to the British company GKN. In 2017 Volvo Cars owner Geely became the largest Volvo shareholder by number of shares after acquiring an 8.2% stake, displacing Industrivärden. Industrivärden kept more voting rights than Geely (Geely getting a 15.8%). In December 2013, Volvo sold its Volvo Construction Equipment Rents division to Platinum Equity. In 2014, Volvo's Volvo Construction Equipment acquired the haul truck manufacturing division of Terex Corporation, which included five truck models and a manufacturing facility in Motherwell, Scotland. In November 2016, Volvo announced its intention of divesting its Government Sales division, made up mainly of Renault Trucks' Renault Trucks Defense but also of Panhard, ACMAT, Mack Defense in the United States, and Volvo Defense. The project for selling the division was later abandoned and, in May 2018, Volvo reorganized Renault Trucks Defense and renamed it Arquus. In December 2018, Volvo announced it intended to sell a 75.1% controlling stake of its car telematics subsidiary WirelessCar to Volkswagen with the aim of focusing on telematics for commercial vehicles. The sale was completed in March 2019. Volvo Trademark Holding AB is equally owned by AB Volvo and Volvo Car Corporation. The main activity of the company is to own, maintain, protect and preserve the Volvo trademarks (including Volvo, the Volvo device marks (grille slash & iron mark) Volvo Aero and Volvo Penta) on behalf of its owners and to license these rights to its owners. The day-to-day work is focused upon maintaining the global portfolio of trademark registrations and to extend sufficiently the scope of the registered protection for the Volvo trademarks. The main business is also to act against unauthorised registration and use (including counterfeiting) of trademarks identical or similar to the Volvo trademarks on a global basis. ^ a b c d e "Report on the fourth quarter and full year 2018" (PDF). Volvo. pp. 16–17. Archived (PDF) from the original on 6 March 2019. Retrieved 2 April 2019. ^ a b "Annual and Sustainability Report 2016" (PDF). Volvo. p. 1. Archived (PDF) from the original on 2 July 2017. Retrieved 8 June 2017. ^ "Volvo to quit Nasdaq". Toronto Star. 14 June 2007. Archived from the original on 20 October 2017. Retrieved 15 June 2017. ^ "Volvo's founders : Volvo Group – Global". Volvo. 14 April 1927. Archived from the original on 22 May 2009. Retrieved 12 June 2009. ^ a b c d e f g h Pederson, Jay P. (June 2005). "AB Volvo". International Directory of Company Histories. 67. St. James Press. pp. 378–383. ISBN 978-1-5586-2512-9. ^ a b "History time-line : Volvo Group – Global". Volvo. Archived from the original on 20 June 2011. Retrieved 12 June 2009. ^ Volvo Group Global. "Volvo 80 years". Volvo. Archived from the original on 22 October 2009. Retrieved 6 November 2010. ^ "1930 – History: Volvo Penta". Volvo Penta. Archived from the original on 3 December 2013. Retrieved 28 November 2013. ^ a b Eliasson, G (2013). "Automotive dinamics in regional economies". In Pyka, Andreas; Burghof, Hans-Peter (eds.). Innovation and Finance. Routledge. p. 130. ISBN 978-1-135-08491-2. ^ "Heccből támasztották fel a Volvo híres traktormárkáját" (in Hungarian). Agrarszektor.hu. 6 January 2017. Archived from the original on 7 January 2017. Retrieved 14 June 2016. ^ "Zo zou de Volvo BM er nu uit kunnen zien" (in Dutch). Mechaman.nl. 24 October 2016. Archived from the original on 20 October 2017. Retrieved 15 June 2016. ^ a b c Donnelly, Tom; Donnelly, Tim; Morris, David (2004). "Renault 1985–2000: From bankruptcy to profit" (PDF). Working papers (Caen Innovation Marché Entreprise) (30). OCLC 799704146. Archived from the original (PDF) on 20 September 2006. ^ Styhre, Alexander (2007). The Innovative Bureaucracy: Bureaucracy in an Age of Fluidity. Routledge. ISBN 978-0-203-96433-0. ^ "Once upon a time..." History, Nedcar.nl website". Nedcar.nl. 1 May 2006. Archived from the original on 29 July 2007. Retrieved 16 May 2012. ^ "ASTON'S CLEARER ADVANTAGE". The Scotsman. 29 November 2013. Archived from the original on 3 December 2013. Retrieved 29 November 2013. The optional satellite navigation remains a Volvo-sourced system that is absurdly fiddly. ^ "Mitsubishi Motors announces alliance with Volvo". The Augusta Chronicle. 10 October 1999. Archived from the original on 20 October 2017. Retrieved 27 June 2017. ^ Miller, Scott (15 February 2001). "Volvo Might Sell Its Mitsubishi Stake Because of Daimler's Control of Firm". The Wall Street Journal. Archived from the original on 20 October 2017. Retrieved 27 June 2017. ^ "Volvo säljer sitt innehav i Mitsubishi". Aftonbladet (in Swedish). 11 April 2001. Archived from the original on 20 October 2017. Retrieved 27 June 2017. ^ "AB VOLVO TRANSFER REMAINING SHARES TO RENAULT S.A". Volvo. 9 February 2001. Archived from the original on 3 December 2013. Retrieved 29 November 2013. ^ a b "Renault raises €3bn with part-sale of Volvo stake". The Daily Telegraph. 7 October 2010. Archived from the original on 4 January 2014. Retrieved 29 November 2013. ^ "Volvo in $1.1bn Nissan purchase". BBC News. BBC. 20 February 2007. Archived from the original on 19 March 2007. Retrieved 29 November 2013. ^ Pearson, David (12 December 2012). "Renault to Sell Rest of Its Volvo Stake". The Wall Street Journal. Archived from the original on 4 December 2013. Retrieved 29 November 2013. ^ "Industrivärden strengthens its ownership position in Volvo". Industrivärden. 13 December 2012. Archived from the original on 3 December 2013. Retrieved 29 November 2013. ^ "GKN's shares soar as it buys Volvo's aircraft engine business". The Guardian. 5 July 2012. Archived from the original on 26 February 2018. Retrieved 27 June 2017. ^ "China's Geely turns to Volvo trucks in latest Swedish venture". Reuters. 27 December 2017. Archived from the original on 26 February 2018. Retrieved 25 February 2018. ^ Fuller, Matthew (12 February 2014). "Despite Raising Eyebrows, BlueLine Prices $252M PIK Toggle High Yield Bond Deal". Forbes. Archived from the original on 13 April 2018. Retrieved 27 June 2017. ^ Latimer, Cole (10 December 2013). "Terex sells trucks arm to Volvo". Australian Mining. Prime Creative Media. Archived from the original on 20 October 2017. Retrieved 14 June 2017. ^ Miller, Graham (31 December 2013). "Volvo buys Terex plant in Newhouse for $160m". Daily Record. Scottish Daily Record and Sunday Mail. Archived from the original on 20 October 2017. Retrieved 14 June 2017. ^ "Further job cuts at Terex truck firm in Motherwell". bbc.com. BBC. 16 June 2016. Archived from the original on 11 January 2017. Retrieved 14 June 2017. ^ Tran, Pierre (4 November 2016). "Volvo Launches RTD Sale, No Timetable". Defense News. Sightline Media Group. Retrieved 14 June 2017. ^ Altmeyer, Cyril (24 May 2018). "Armament terrestre: Renault Trucks Defense (Volvo) devient Arquus" [Ground army: Renault Trucks Defense (Volvo) becomes Arquus]. L'Usine nouvelle (in French). Archived from the original on 1 April 2019. Retrieved 1 April 2019. ^ "Volvo Group To Divest 75.1% Of Shares In WirelessCar Unit To Volkswagen". Markets Insider. 19 December 2018. Archived from the original on 1 April 2019. Retrieved 1 April 2019. ^ "Volvo Group has completed the sale of shares in WirelessCar" (Press release). Volvo. 29 March 2019. Archived from the original on 1 April 2019. Retrieved 1 April 2019. ^ "Volvo Annual Report 1999". .volvo.com. Archived from the original on 16 March 2012. Retrieved 6 November 2010. ^ "The Volvo Brand Name, Volvo Annual Report 1999". .volvo.com. Archived from the original on 17 July 2011. Retrieved 6 November 2010. Official Volvo website – for Volvo-branded companies. 1Joint venture with Eicher Motors. 2Joint venture with SDLG.